Community Representatives needed! – Are you interested in representing your community on Cork Local Drug & Alcohol Task Force? » Comhar Chathair Chorcai Teo, Cork City Partnership Ltd.
Community Representatives needed! – Are you interested in representing your community on Cork Local Drug & Alcohol Task Force? Cork Local Drug and Alcohol Task Force (CLDATF) is a board composed of statutory, community, voluntary sector and public representatives. The Task force funds 21 projects that work to combat drug and alcohol misuse in Cork communities. The sitting community representatives are keen to encourage new voices from communities around the city to come forward and participate, and emphasise that this role is essential in countering disadvantage and ensuring that resources are targeted to drug and alcohol issues. Support to community representation on the Task Force is provided by the Community Outreach Drug and Alcohol Support Project (CODAAP) at Cork City Partnership, who meet regularly with community reps, provide information on training, education opportunities, assist with meeting preparation etc. CODAAP’s Mella Magee spoke with the current community representatives to get their take on what the role involves and find out why people should come forward for the new vacancies. How would you describe the role of community representation on the CLDATF Grainne? As the longest serving community representative on the CLDATF Tom (Carey), what would you see as the challenges and opportunities to the position? Do you think that community representatives tempered the impact of the recession? What qualities do you think a community representative should bring to the task force? Aaron recommends that someone considering going forward “would need a good understanding of what’s happening in their area, a genuine interest in pushing for what’s best for their community, and a willingness to be heard and to learn. 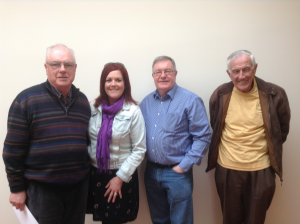 The process of being part of the decision making process is a steep learning curve – we will support you in that.” Grainne said being willing and able to work with the other community representatives is important; “all the community representatives work together in a process. One representative doesn’t overpower what they want for their community above others”. Last but not least, ‘what’s in it for you’ in being a community representative? If you are interested in becoming a community rep on Cork Local Drugs Task Force, please contact Joe Kirby, CLDATF co-ordinator on 021 493 0102 or Mella Magee, CODAAP project on 021 430 2310 to get an up date on the new process for community rep selection.